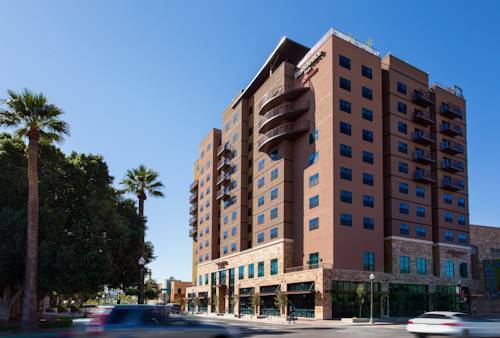 Discover the perfect home away from home at Residence Inn Tempe Downtown/University, just minutes away from Arizona State University and the famous Sun Devil Stadium. From the bars and eateries on Mill Avenue to the artistic performances of the Tempe Center for the Arts, our local area is bustling with activities for all ages and interests to enjoy. After a successful day of exploration, retreat to your suite featuring separate spaces to work, relax, dine and dream. Stay productive with a large workspace and complimentary high-speed Wi-Fi, or cook up a mouthwatering meal in your fully equipped kitchen. Wake up the next morning to a free breakfast buffet featuring fluffy eggs, crispy bacon, fresh fruit and cold cereals. As your trip comes to an end, get back to reality quick and easy with our complimentary shuttle service to Phoenix Sky Harbor International Airport. Whether joining us on business or leisure, we have everything you need to make your stay a success. Reserve your suite today! - Tempe Transit Center & West on 5th St.
A folk art environment constructed from bits of Fiestaware -- with only a little Strontium 90. Private yard. Wooden church building appeared in an Elvis film and survived 1969 and 2004 fires at nearby Apacheland Movie Ranch. Moved to museum property as an attraction and a place to get hitched.